"Add a nostalgic trip down memory lane to your special day with one or more of our timeless cars"
Why not experience the charm and excitement of hiring a Vintage Car to transport you on your special day! We are a small family run business,managed by myself, Karen and my husband, Geoff and as such we pride ourselves in helping to make your day one to remember. Nothing is too much trouble and its the little touches that matter. We only do 1 booking per day, so yours will be the only 1 on that day. The price we charge is for up to 4hrs car hire with chauffeur, and the extras as listed below. If you want it for longer, there is a small charge of £25 per hour. There are some optional extras(see below). The Beauford Convertible is a real head – turner and a photographers dream. The exterior is cream and black in colour with biscuit coloured seats. This stunning car seats up to 3 passengers plus the chauffeur and is ideal for a dramatic entrance for the Bride and Groom. The roof folds down in minutes! There are even drop down tables to place your champagne flutes on! 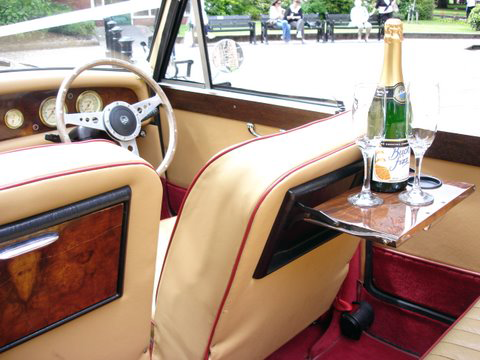 The Austin Landaulet Convertible is lovely and spacious, seating up to 6 passengers and the chauffeur. This car is truly unique and is the only 1 of its kind in the UK. There is over 1 metre of legroom, so it can easily accommodate all wedding dresses no matter how extravagant! 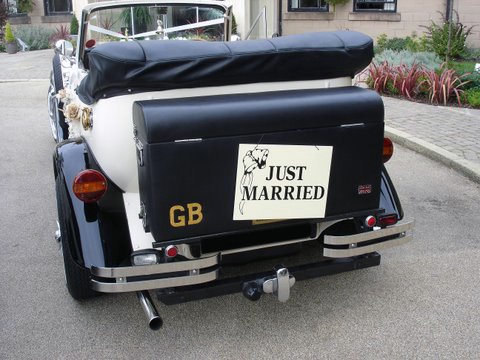 It is perfect also for Bridesmaids/pageboys and complements the Beauford perfectly. The roof folds down in minutes if you wish to be at one with nature! The privacy screen gives you those moments together, en route to your guests! It has cream and black bodywork and cream interior. If you prefer more modern cars we have a beautiful Mercedes S Class. This car can comfortably seat up to 4 passengers plus chauffeur on its cosy leather seats. The exterior is silver in colour. Large white umbrella`s for inclement weather! White parasol if the sun is too bright! Why not add the WOW factor and amaze your guests, not to mention capturing unique wedding photographs!!! !available on the Beauford only. At the touch of a button a plume of confetti is released 100 ft/30 metres into the air creating a beautiful and stunning feature for your special day. The remote controlled system can release 1 or 2 confetti showers-perhaps 1 after the ceremony and 1 at the reception,you decide. We will work with the photographer to ensure the best possible photos. This is an optional extra and cost £59 for 1 or £99 for 2. Why not upgrade to champagne for an additional cost of only £40 and toast each other with our beautiful Moet and Chandon Champagne flutes and matching ice bucket. Please feel free to fill in the enquiry form and ask any questions. Contact us to arrange viewing by appointment.